With a relaxed program including daily practice of yoga and meditation and drinking fresh fruit and vegetable juice make a new start on your journey towards health and wellbeing. At this retreat we use fresh juice and Triphala, an Ayurvedic herbal detox tonic for a complete body cleanse. By putting your body and mind in a soothing environment away from the stress of everyday life, drinking nourishing and cleansing juices and practicing yoga and meditation you allow yourself to detox, relax and heal. Raw fruits and vegetables are nutritional powerhouses which detox your body and help make you healthy and strong inside and out. One glass of fresh fruit and vegetable juice gives more nutrients than many people get in two or three days!! The vitamins and minerals in the juice help to fuel the body during cleansing and the naturally alkaline pH level of most fruit and veg helps to rebalance the pH of the body. Common foods like red meat, sugar and grain increase acidity in the body and excess acidity leads to a wide range of health problems which can be counteracted easily with a juice detox. 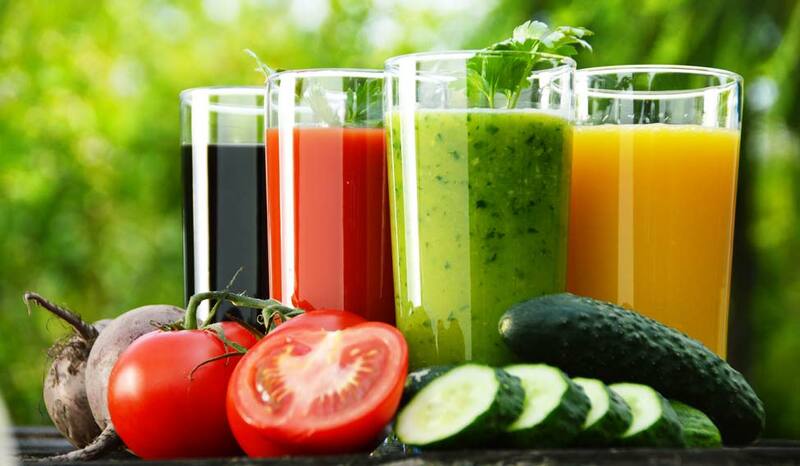 • Raw fruit and vegetable juices contain an abundance of living enzymes which help promote a healthy internal system. These enzymes help the body break down food and have many health promoting properties. Health on the inside creates health on the outside!! • Raw fruit and vegetable juice has anti-inflammatory properties. Studies have shown that inflammation plays a huge part in many of our western diseases and ailments. When undertaking a detox juice fast it is essential that the majority of juice consumed be in its raw state. When heated to high temperature, enzymes are de-activated and vitamin content reduced. Giving the body the maximum amount of enzymes, vitamins and minerals possible, allows it to detox fully and heal effectively. Literally meaning “three fruits”, the powdered form of Triphala is a balanced mix of three fruits with powerful healing properties: Indian Gooseberry, Chebulic Myrobalan and Belleric Myrobalan . Indian gooseberry (emblica officinalis) or Amla, is considered one of the best rejuvenating herbs in Ayurveda. It’s a strong natural antioxidant containing 20 times more vitamin C than orange juice. In India, Amla is known as the “nurse herb” because it strengthens the immune system and cools the body, balancing the Pitta dosha. Chebulic Myrobalan (terminalia chebula) or Haritaki, has the strongest laxative powers of the three fruits contained in triphala. In Tibet haritaki is so highly revered that in their sacred paintings it’s often depicted in the extended palm of the medicine Buddha. The herb also has astringent properties and balances Vata. Belleric Myrobalan (terminalia belerica) or Bibhitaki is an excellent rejuvenative with both laxative and astringent properties. It eliminates excess mucous in the body, balancing the Kapha dosha. In addition, Bibhitaki is a powerful treatment for a variety of lung conditions, including bronchitis and asthma. Triphala helps in all tridoshic diseases: constipation, diarrhea, cleansing the eyes or detoxing the colon. It is good for Kapha conditions: gas, bloating, diabetes, parasites. • Dada Krsnasevananda: Senior Acarya (teacher) of Ananda Marga. A lifetime’s experience teaching yoga and meditation. • Manojita: Our resident instructor and teacher trainer at Ananda Gaorii. Manojita is a talented and loving teacher with a strong committment to the health and well-being of his students. Ananda Gaorii Ashram, Farm and Learning Center is located on 13 hectares of farmland near Vig, about an hour from Copenhagen. We have a small orchard, vegetable garden, organic bakery, meditation hall and accommodation for sixty people. We have a small number of private rooms but mostly the accommodation is in dormitories for men and women. We usually have 10 to 20 volunteers who are helping with the farm, renovation, cleaning and maintenance and who come to experience our yoga lifestyle. Sleeping Bag, sheet, pillow if you need one, comfortable loose fitting clothes for yoga, indoor slippers, pen, notebook, something to read, warm clothes for outdoors, towel, toiletries. Buy a ticket to “Vig”. Change at Holbæk to bus or train. We will pick you up in Vig. Kindly call us half an hour before you are due to arrive. If you come by car navigate to Holbækvej 56, 4560 Vig.